Wexford born, Cork based Lynda Cullen released her new album Paper Boat in 2014. Her captivating performances have won her a loyal and growing fan base on the live music scene in Cork and throughout the country. In the last 4 years, Lynda has performed at various folk festivals and shows in Austria, Germany, Sweden, the UK & France. 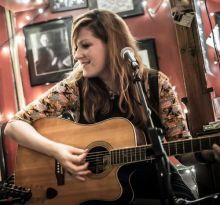 At home in Ireland, she has toured extensively throughout the country, and has opened for such notable acts as Ron Sexsmith, Willie Watson, Damien Dempsey and John Spillane. Her music has been featured on regional and national radio, most notably The Jon Creedon Show on RTE 1 Radio and The Blue of The Night on RTE Lyric FM. As a member of 'Second Moon,' Lynda spent 5 years in South Korea where their debut album picked up 3 awards at the 2006 Korean Real Music Awards. She has just returned from a successful reunion tour with them in South Korea (Nov 2015). Lynda is currently preparing for a new single release in August 2016 ahead of a nationwide tour and a tour of the Czech Republic.